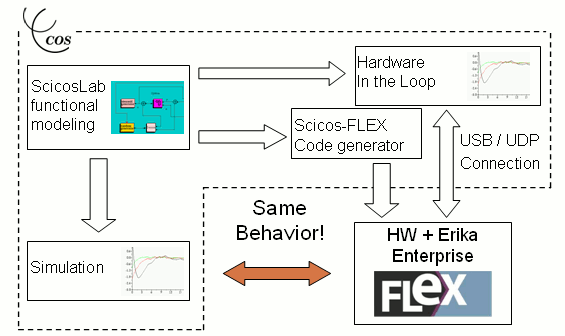 Scicos-FLEX allows the development of a single-click digital control automatic code generation tool supporting ERIKA Enterprise targets, based on ScicosLab. The code generator of scicos-FLEX is a direct derivation from the Linux/RTAI Code Generator for Scicoslab. Design of a control system in Scicos. Simulation and tuning of the control system in Scicos. Automatic flashing of the FLEX board. Integration in the Scicos HIL support using the FLEX USB/wireless connection. Code generator for ERIKA Enterprise. Finite State Machine Simulation using SMCube. Over 100 Scicos blocks ready for code generation! Automatic generation and compilation of the Scicos generated application. Manual flashing of the generated application on the dsPIC device on the FLEX board. Working examples using the FLEX board. Tutorial for the creation of a sample application included in the documentation. Hardware in the loop working. ScicosLab 4.4.1 (official mirror) WE TESTED IT USING THIS VERSION!!! ERIKA Enterprise and RT-druid are included in the ScicosLab Pack. ScicosLab Pack requires cygwin to compile Erika Enterprise. Here is a minimal installation pack for Cygwin. SMCube is a tool to create, simulate and generate code for discrete time finite state machines. a Qt-based application for interactive simulation of the FLEX Demo Board. Documentation is available on the SMCube Manual. Complete support for the EASYLAB board, for simulation and code generation. More information about the EasyLab board. New palettes: SMCube and Miscellaneous. New Blockset for the FLEX DEMO board. New documentation of the blocks, available in the ScicosLab Help. New Scicos CodeGen menu to save user preferences. New communication blocks for Flex and Easylab (RS232, UDP, CAN, USB, ...). Added DLL to enable diagram simulation with the ScicosLab-Pack blocks, try the tutorial!